What are the reasons for Mutation? 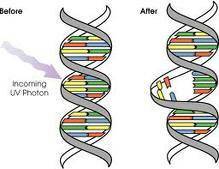 Mutations are changes in a genomic sequence: the DNA sequence of a cell's genome or the DNA or RNA sequence of a virus. Mutations are caused by radiation, viruses, transposons and mutagenic chemicals, as well as errors that occur during meiosis or DNA replication. Tautomerism – A base is changed by the repositioning of a hydrogen atom, altering the hydrogen bonding pattern of that base resulting in incorrect base pairing during replication. Depurination – Loss of a purine base to form an apurinic site (AP site). Deamination – Hydrolysis changes a normal base to an atypical base containing a keto group in place of the original amine group. Slipped strand mispairing - Denaturation of the new strand from the template during replication, followed by renaturation in a different spot lead to insertions or deletions. Mutations occur up to 100 times more frequently than the normal mutation rate in the hot spots of DNA. This will be in an unusual base. Different species has different mutation rates. Higher mutation influences the evolution of organisms. It is very beneficial when it allow organisms to evolve and therefore adapt more quickly to their environments. Cause errors in protein sequence and creates non functional proteins. All proteins should work properly for the function of cells. If protein get altered by the mutation it may result with malfunction of protein. This is known as genetic disorder. DNA base sequences get altered by some mutations but it won’t change the protein function. If a mutation occurs in the germ cell like egg or sperm it will pass on to the offspring and the mutant genes carried over to next generation and leads to hereditary diseases. The mutation sometimes helps the mutant organism to adapt to the environmental stresses and helps to reproduce more quickly. Want to know more about “Mutations?” Click here to schedule live homework help from a certified tutor!